Where Zena Road meets Route 212 just outside the town of Woodstock, there’s a magnificent 22-acre open field with a sweeping view of Overlook Mountain. It's had some lives: agriculture, a drill field for militia in the War of 1812, and corn production for so long, it became known simply as The Cornfield. When it was listed for sale around 1989, it took the newly formed Woodstock Land Conservancy (WLC) just eight weeks to raise the more than the $160,000 needed to purchase it. In 1987-88, a small group of Woodstockers formed the WLC in response to the inadequacy of local zoning laws to protect land under pressure from development. 550 people pledged anywhere from $99-$3000 each to the WLC, and rescued The Cornfield from the threat of suburban sprawl. Only the second property acquired at the time, its purchase put the WLC on the map and remains a signature asset for an organization that, in the past 25 years, has protected (both through acquisitions and easements) more than 1,000 acres of Woodstock. With mitigation to undo the harm done to the land from years of pesticide use, Zena Cornfield is now a healthy public preserve. And on Saturday, April 1st, it’s the ideal spot to bring the kids and fly a kite. 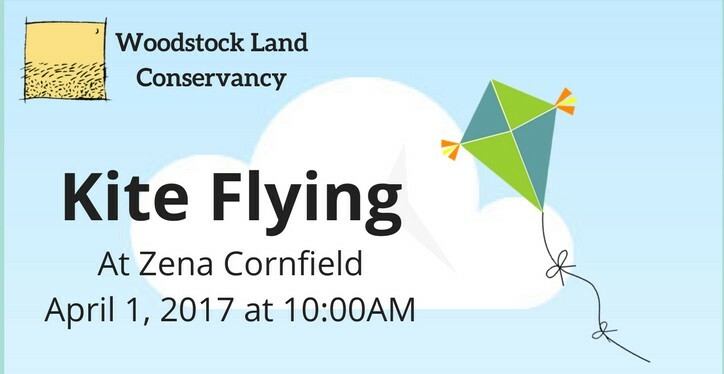 Kite Flying with the Woodstock Land Conservancy at Zena Cornfield: Zena Road near Route 212; parking is available across the street from where Gitnick Road veers off from Zena Road (the same parking spot for Little Deep and Zach’s Waterfall); Saturday, April 1st, 10a-12p (Zena Cornfield is open dawn to dusk); free! Bring a kite, if you have one. There are no bathroom facilities and the park is carry in, carry out. Weather-related updates will be posted on their Facebook page. Check out the WLC’s Thorn Preserve, which is just down Zena Road on John Joy Road. And don’t miss the WLC’s Vernal Fling fundraiser on May 27th!